The Swiss chard (Beta vulgaris var. cicla) we find in our markets, with its long white stems, is prized by Mediterranean cooks for flavoring soups and rice dishes. Swiss chard is a popular vegetable in Provence, in fact the queen of vegetables in Nice, and is grown abundantly in the districts around the Rh�ne valley because it can withstand cold weather, and is harvested up until the frost. Although Swiss chard was known by the ancient Greeks, it is not always recognized in historical literature because of the enormous variety of names, in various languages by which it is and has been called and because of its relation to the beet family. 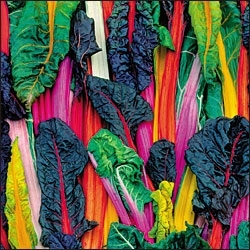 In English it is also known under these names: chard, white beet, strawberry spinach, seakale beet, leaf beet, Sicilian beet, spinach beet, Chilian beet, Roman kale, and silverbeet. Originally, chard was a corruption of the French word for cardoon, carde, and the name was Swiss cardoon, a misnomer that William Woys Weaver, author of Heirloom Vegetable Gardening, likens to another famous misnomer, �Jerusalem artichoke.� In Italian it�s hard to recognize Swiss chard because the words bietole and biete are both used to refer interchangeably to Swiss chard and beet greens (Beta vulgaris sp. Crassa group). Technically, biete da costa is Swiss chard, so named because it originally was grown and thrived in the saline soil that is found along the coasts, while biete da orta are beet greens, so named because it was always a cultivated vegetable garden plant. To complicate matters in Italian, costa also refers to the thick central stem ribs of the Swiss chard, usually used to make soups, and sometimes refers to the whole plant. The French blettes or bettes comes from the Latin blitum, deriving from the Greek, while the Spanish word for Swiss chard, acelgas, comes from the Arabic word al-silq, meaning Swiss chard.